Hi ! Renxkyoko Iglesias here ! Let me first greet you a happy, productive, prosperous, and peaceful 2015 ! ! As for me, I think 2015 is the year my life changes, for the better, I hope. I am a Microbiology graduate, minor in Chemistry, and this spring, I’ll be graduating in Forensics Science. 2 majors, 1 minor. I’ve already found my mojo, so I think that’s enough studying. I’ve had it. I’ve covered all the bases. I’m ready to face the world ! ! ! Or not. But then, this post is not about my future….. it’s about food, and my family’s Christmas celebration. By the way, I’m sure you’ve all received WordPress’s Annual Report. Oh, my, my total number of posts in 2014 is, ta- da ! 13 . XD This post makes it my 14th post……. which is a good thing , because , to me, 13 is an unlucky number. Superstitious crap, I know. But, do you know that in the Philippines, no building has a 13th Floor. If the building has 13 or more floors, the actual 13th floor is designated as the 14th. Also, when they erect the stairs , they have this ritual of counting , from the lowest rung, Oro, Plata, Mata ( which means, Gold, Silver, Death ), and the topmost rung should not end with Mata. ( Death ) The 13th stair is Mata. There you go… a useless trivia from me. *chants* Oro, Plata, Mata, Oro, Plata, Mata, Oro, Plata, Ma….. Noooooo ! ! So, 2 days before Christmas, my Mom and I went grocery shopping at the Filipino supermarket. . We saw Queso de Bola, a standard Filipino food item and lots of chestnuts… we bought a few pounds of chestnuts , but not the cheese. On Christmas Eve, we went to Mass at 10 PM, temperature was 33 F (~0C ). Darn, it was cold ! Those are my folks in the picture. I had to walk back to take the pic. All’s well that ends well. So, here are the photos of our Christmas spread. From right to left….. roast pork pork roll ( lumpia ), leche flan ( custard ) chicken macaroni salad, red velvet cake, buckeye, cheesecake, and refrigerator cake. I wrote on my previous post that I’d cook my specialty, Paella. Well, I didn’t. We forgot to buy a major ingredient. Instead , I cooked Pancit a la Malabon ( noodles ) and fried rice. I didn’t bake fruit cake , either, a staple at any Filipino Christmas fare.
. That’s embutido… just pork loaf, and oh, yeah, you can see the ube jam. That one above are lychees and almond gelatin. Cheesecake, buckeye ( just peanut butter, powdered sugar, dipped in choco dipping )…. and you can see the refrigerator cake, and red velvet cake, and the leche flan. Okay, a few more pictures…. the opening of gifts. My annoyance at my sister disappeared when I opened her gift… a Kindle ! And dad gave me a new laptop ! ! Oh, that’s my Mom’s photo when she was young, it’s random, but I thought I’d just post it here. And a Christmas pic of yours truly from 2 years ago… dressed up , you know. So, that’s it…. my last post for 2014…. my 14th post. WordPress should take note of that. Happy New Year to all ! PEACE ! !. 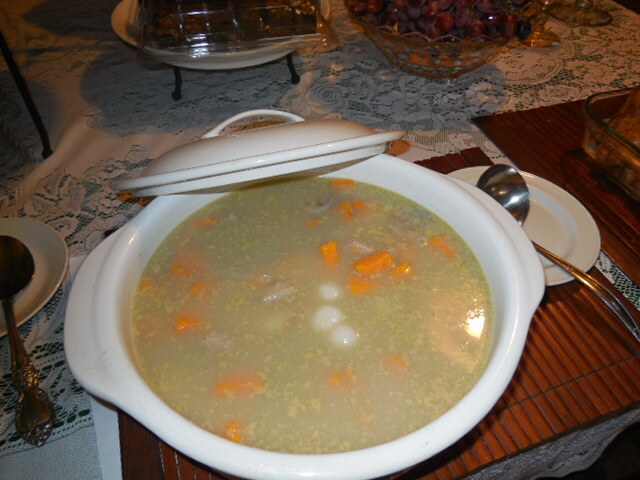 But, before I talk about Christmas, let me show you what we had for Thanksgiving Day. Yeah, it’s foodie time. Actually, there wasn’t much food, compared to last year’s. It seems we’re getting less and less food every year, but it’s okay, we do throw away so much , especially the turkey. That’s why we don’t do turkey anymore. By the way, I cooked most of the food. Not bragging, though. Just sayin’. Oh, wait, before I forget…. can someone please translate this? It’s Japanese. I want the exact translation, please. You’ll help me win an argument. 🙂 Thank you. He he. I know it’s juvenile. Roast pork ( lechon),, with liver gravy, ham, kare-kare ( beef stew in peanut sauce,) there’s noodles ( pancit ala Malabon ) , fruit salad, potato salad, lumpia ( pork eggroll with sweet – sour sauce), and various cakes. 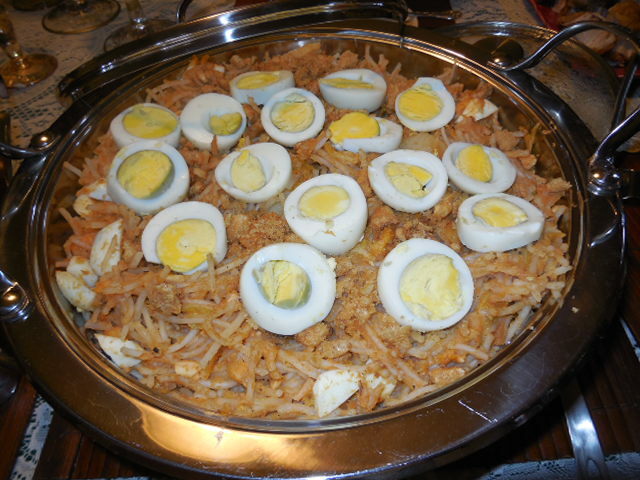 Pancit a la malabon. Malabon is a place in the Philippines. I think this is Malabon’s specialty. I cooked that. Do you know what’s in there ? Shrimps, flaked smoked fish, pounded chicharrones ( pork cracklings ) Napa cabbage, and the juice of pounded shrimp heads. This is Renxkyoko’s specialty……. Lumpia ( ground pork eggroll. ) I stayed up the whole night ( and morning ) rolling the darn things. I made a lot, for us, and for our Forensic class’s assistant teacher. 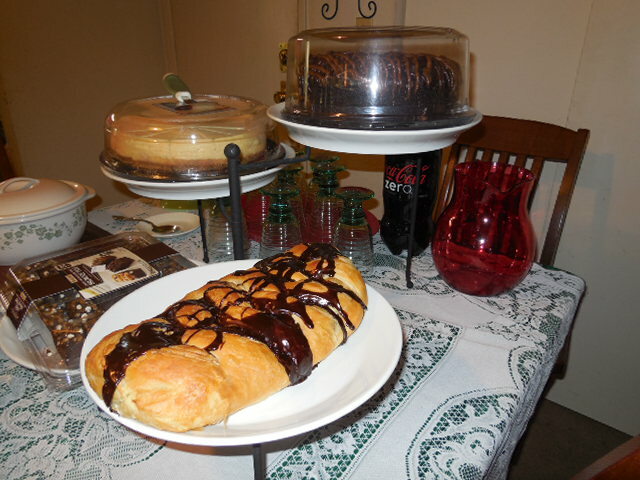 Huge pastry with Bavarian Cream filling, Double chocolate cake, cheesecake, and brownies. We baked the pastry. We bought the rest at Costco. 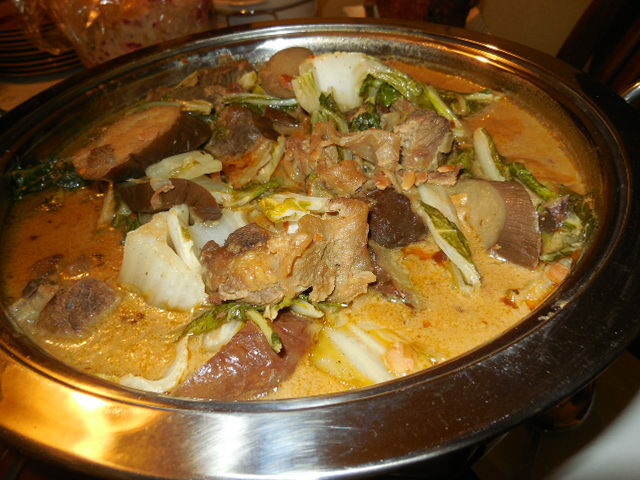 we call the above dish Ginatan. It’s made of sweet potato, cooking banana ( saba ), taro root, rice balls, and coconut milk. And sugar, of course. So, that’s it, our Thanksgiving Day meal. We already have a menu planned for our Christmas meal. I am definitely going to cook my other specialty….. Paella. And I’m looking forward to a family Christmas tradition……….. the whole family going to Chrismas Eve Midnight Mass. Here in the US, it’s at 10 PM…… in the Philippines, it’s at 12 midnight. We used to have our Christmas meal right after the Mass, but we had discarded that. My mother said it was stressful. But we do open the gifts as soon as we arrive from the church. 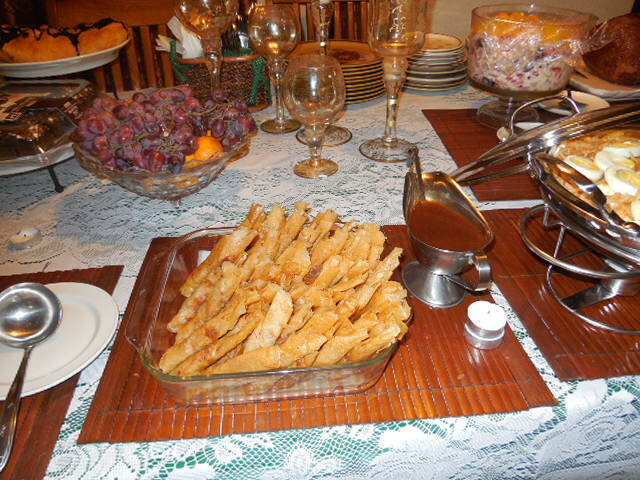 In the Philippines, the midnight meal is called Noche Buena. 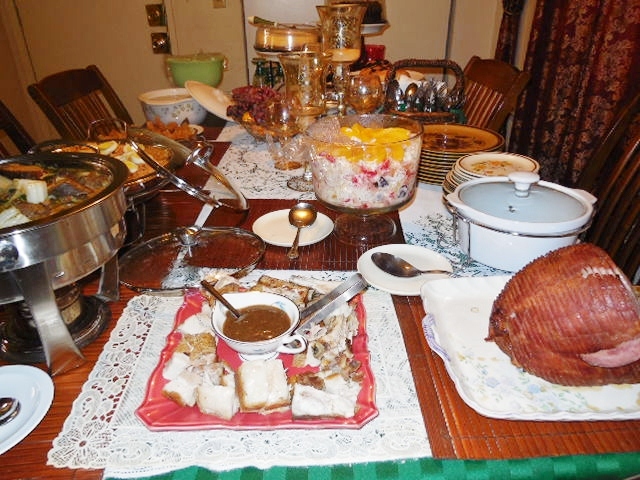 So, what ‘s a typical Filipino Noche Buena ? Bread , ( pan de sal, bite-sized French bread ) with Queso de Bola ( Edam Cheese ). Jamon ( ham , glazed with pineapple and sugar, ), castanas, ( chestnuts) noodles, ( at home, it’s baked macaroni ), leche flan, ube jam, ( purple yam ) and yes, fruit cake ! These are the icons of Filipino Noche Buena. I’m going to bake fruit cake, that’s for sure. And it isn’;t like the fruit cakes that are sold here in the US. They ‘re nasty. No wonder Americans make fun of them. My recipe is delicious. Lots of rhum in it ! I actually want to have a food blog . But, I don’t think it will happen. I don’t even have time to post here. Don’t be surprised why I’m interested in food. My mother had a successful catering business in the Philippines, and if we didn’t come here to the US, she would be holding a Dunkin’ Donut francise. Oh. 550 words, already. Time to to say bye for now. Thank you for reading and PEACE !